Regardless of the industry you’re in, you’ll surely require some type of commercial truck to help you perform all of your relevant services. For instance, a passenger van makes for an excellent delivery vehicle, or the vehicle could alternatively serve as a quasi-bus. These trucks and vans tend to be incredibly versatile, so you’ll surely find some use for these vehicles. Fortunately, prospective buyers won’t have to look particularly hard for a relevant commercial truck, as Chevy offers three capable vehicles that can appeal to a wide designation of different businesses. The 2017 Chevy Express Cargo Van, the 2017 Chevy Express Passenger Van, and the 2017 Chevy City Express provide a combination of power, interior room, technology, and safety, and there’s truly no better choice in the entire industry. There’s so much to like about the Chevy Express Cargo Van, and this is a big reason why a variety of different industries continue to turn to this vehicle. It starts with the incredible engines, as the vehicle is more than capable of overcoming any terrain or worksite. The 6.0-liter V8 Vortex Engine is one of the most popular offerings, as the system provides drivers with 342 horsepower and 373 pounds-feet of torque. Alliteratively, customers can opt for the Duramax 2.8-liter Turbo-Diesel engine, which is coupled with the brand’s eight-speed automatic transmission. Drivers can anticipate 181 horsepower and 369 pounds-feet of torque from this particular unit, resulting in a 7,000-pound towing capacity. Those who opt for the 2500 Express or 3500 Express will also have access to the Vortex 4.8-liter engine, which manages to deliver 285 horsepower and 296 pounds-feet of torque. While the powerful engines are certainly appreciated, many owners tend to value the vehicle’s incredible versatility above all else. This probably explains why contractors, electricians, and plumbers often find themselves opting for the Express Cargo Van. There are a number of available features (including a ladder rack and various storage packages) that will make it much easier to travel to a worksite or home, while the sliding cargo door and rear swing-out doors will maximizing convenience as you’re looking to store all of your cargo. Best of all, the vehicle delivers an impressive 313.9-cubic-feet of space, so you’ll never have any issues fitting your necessary equipment. The vehicle is also equipped with a number of technological amenities. There is a 120-volt power outlet and a pair of auxiliary outlets, allowing you to charge or power any of your equipment. The Chevy MyLink system provides easy access to a number of useful applications via the seven-inch touchscreen, including a reliable navigation system. Owners can even opt for the 4G LTE Wi-Fi, allowing them to consistently stay connected to the wireless internet. This vehicle offers many of the same amenities as the standard 2017 Express Cargo Van. Customers can choose the incredible, 342-horsepower 6.0-liter V8 Vortex Engine, or they can opt for the 2.8-liter four-cylinder Duramax turbo-diesel engine, which delivers 181 horsepower and a 6,200-pound towing capacity. The 2017 Chevy Express Passenger Van also includes similar technological offerings, like power outlets, 4G LTE Wi-Fi, and the Chevy MyLink seven-inch diagonal color touch-screen. Where the Express Passenger Van really separates itself is via the passenger room, as the vehicle can accommodate up to 12 occupants (15 with the expanded wheelbase option). Inclusions like the swing-out doors and sliding rear passenger door make it easy to store any cargo you may be transporting and also makes it incredibly easy for any passengers to enter or exit the vehicle. Furthermore, these individuals can stay comfortable thanks to the power front windows and the available rear passenger air conditioning. As a result of all of these features, the 2017 Express Passenger Van is often relied on by airports, nursing facilities, and doctor’s offices. Best of all, every occupant will enjoy the utmost safety thanks to the vehicle’s considerable preventative safety features. The StabiliTrak Electronic Stability Control System allows the driver to stay in complete control of the hulking vehicle, while the rear vision camera and Park Assist technology will help the operator avoid fender benders. If the vehicle does find itself in an accident, occupants can rely on the head-curtain, side-impact, and seat-mounted thoracic air bags to keep them safe. If necessary, the driver can also use the OnStar Automatic Crash Response System to get emergency personnel to the crash site as soon as possible. This particular commercial truck is the perfect alternative for those who don’t need all of the interior room that accompanies both the Express Cargo Van and Express Passenger Van. Of course, that doesn’t mean that the Chevy City Express still isn’t capable of delivering the necessary amount of cargo space. Owners can expect 122.7-cubic-feet of cargo room, as well as 82.8-feet of space behind the front seat, allowing them to fit practically any cumbersome or oddly-shaped piece of equipment. Plus, thanks to the 40/60 split rear doors, loading the vehicle is incredibly easy. This probably explains why this particular vehicle is a popular choice among plumbers, heating/air conditioner services, bakers, and florists. Since this commercial truck is a bit smaller than the alternative, it’s equipped with the smaller 2.0-liter DOHC I4 engine. This unit is still plenty capable, delivering an impressive 131 horsepower and 139 pounds-feet of torque. Plus, thanks to inclusions like variable valve timing, owners can also anticipate a 26-mile-per-gallon highway fuel efficiency. This means individual businesses won’t have to account for extra money at the gas station. 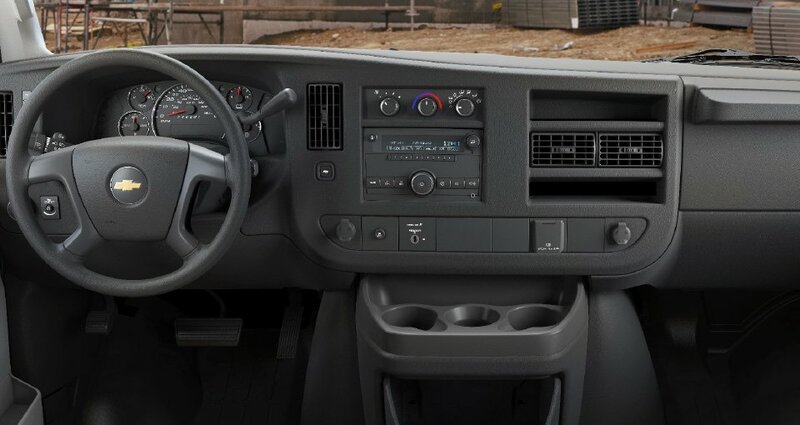 Similar to the brand’s other commercial trucks, this van is equipped with an extensive navigation system, and owners can even opt for the incredible SiriusXM NavTraffic service. The accompanying Bluetooth technologies allow drivers to safely and easily make phone calls, and access all of their phone’s musical playlists. Of course, Chevy made sure to add a number of safety capabilities to their 2017 Chevy City Express. The vehicle is equipped with six standard air bags, a Tire Pressure Monitoring System, and the Rear Vision Camera System, all providing the utmost safety. Technologies like the Electronic Stability Control will also play a significant role in the vehicle, avoiding those potentially devastating accidents. Now that you’re targeting one of these specific conversion vans for sale, you can begin the car-buying process. For those living in the Albany, New York area, there isn’t a better place to purchase that vehicle from than DePaula Chevrolet. The dealership has an assortment of commercial trucks sitting on their lot, and you’re unlikely to find a better deal elsewhere. If you’re looking for a new Chevy conversion van, then you should head into DePaula Chevrolet today.